Ellen Axson Wilson apologizes for not writing to Jessie as she was looking for a cook. I hope you have not been thinking any “hard thoughts” of me for delaying so long to write. 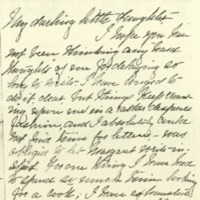 I have longed to do it, dear, but things keep crowding upon me in a rather desperate fashion, and I absolutely could not find time for letters,—was obliged to let Margaret write instead. For one thing I have had to spend so much time looking for a cook; I have exhausted all the possibilities in Princeton and Phila., and tomorrow I must spend the day making the round of the New York agencies. Absolutely no one will come to Princeton at any price. One woman said she “wouldn't go to New Jersey to cook for St. Peter!” Then Margaret and I have been on two shopping tours to Phila, and I had to go to the dentists & to Dr. Keen again about Nellie. There has also been the Trustee luncheon you know, and all the fall work of the Infirmary Executive Board,—reports to make out, meetings, &c. Also Katie Murray to superintend for several days past. Also a dinner of twenty to arrange for next Friday, when the new hall in is to be formally opened. Mrs. McKee, whose first husband gave it, is to be be our guest on the occasion with her second husband!—An amusing situation! It is hard to have guests in the house before I get a cook,—but there is no help for it.Your father is in Nashville at his brothers tonight,—will not get back until Thursday; he went down, you know, to make an Alumni Address in Chatanooga. He seemed very well and bright when he left. Margaret looks remarkably well and is having a very nice time, I think. She arrived at Mrs. Magie's on Tuesday & both there and at Mrs. Harper's tea met, a number of attractive men and enjoyed herself hugely. Mrs. David Magie is giving her a dinner, all young people, next this week. She is also of course to be at the “big dinner” here on Friday. And she is to go to a dance at the Campus Club. Her card is being filled for it. But the thing she is enjoying most is the singing with the “special choir.” They have a splendid trainer from New York and are studying some beautiful Xmas music. Last night Mr. Kellogg brought her home from it and they had a beautiful time singing together; he has a fine voice and is a musical enthusiast. I have heard at last from Madge She has decided to go to Atlanta for a rather long visit, I infer,—from the fact that she sent for all her clothes to have them done over there. They told me yesterday in Phila. that your two dresses had just gone,—and I saw your hat,—a perfect beauty. It and Nell will start tomorrow. Nell's hat also is perfectly lovely. Her little red dress had not yet come from the makers. You remember a larger size was needed. Margaret too has had to wait for her things from the makers, the blue velvet and a blue princess, something like yours. But she has a jaunty little green & blue (small check) walking dress, and her hat is going to be lovely. Wilson, Ellen Axson, “Ellen Axson Wilson to Jessie Woodrow Wilson Sayre,” 1906 October 28, WWP17347, Jessie Wilson Sayre Correspondence, Woodrow Wilson Presidential Library & Museum, Staunton, Virginia.